Bring hazardous items to Cheboygan County Fairgrounds office on Lincoln Ave.
Winter Hours: November - April: The first Wednesday each month 12pm-3pm. - NO EXPLOSIVES, Ammunition or radioactive materials. Replace plastic grocery bags with reusable grocery bags. You may buy these bags in most supermarkets. Many are made from recycled materials. You or your children can personalize them with indelible marker. Remarkably strong and durable, they can carry heavy loads and be reused over and over again. If you have plastic bags, please recycle them at one of our drop-off locations in the appropriate bin. Buying in bulk reduces the amount of wasteful packaging that cannot be recycled. Opt for cardboard instead of styrofoam and choose brands with the least packaging or those packaged in recyclable marerials. Think creatively about items you can reuse. Baby food jars and clear peanut butter jars for nuts or screws. Small boxes and plastic containers for drawer organizers. Old mugs for pen and pencil holders. Used loose-leaf notebooks for your tool manuals or your volunteering notes. Junk mail envelopes for organizing monthly receipts. Backs of printed paper for grocery lists and messages. Native Americans traditionally re-gifted usable and sometimes valuable items to each other. When you are through using an item which is in good condition, consider re-gifting the item as a keepsake to a relative or friend. An extension of this idea is donating items to charity. 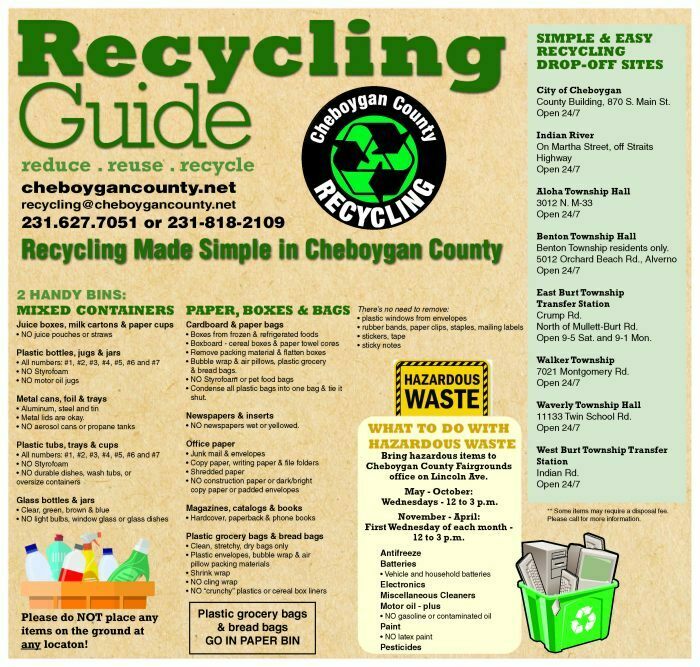 In Cheboygan County, many places accept items in good condition for re-use either by giving them away or selling them to support the charity. We welcome your ideas for going beyond recycling. A large variety of items are made from recycled plastics! Plastic (including rinsed #1 & #2, #5, #6, #7 items), tubs (yogurt, margarine), trays, clear clamshells, plastic grocery and bread bags (clean, dry, and bagged), plant cell packs, Tupperware - Manufacturers in Michigan Make other plastic bottles and jugs. Tin Cans - Manufacturer in East Jordon, MI makes fire hydrants, utility/manhole covers, and large truck brake drums. Aluminum - Scrap dealers sell to makers of aluminum cans and car and airplane parts. Clear and Colored Glass - Manufacturers in Michigan make items such as glass bottles and concrete blocks. Cardboard - Mills in Michigan, Indiana, and Ohio make cereal board, liner board, and the fluted portion of corrugated cardboard. Newspapers and Magazines - Mill in Michigan, Indiana, and Ohio make cereal board, newspaper, insulation, and mulch. Office Paper - Mills in Wisconsin make tissue paper, writing paper, and copy paper. Phone Books and Hard Cover Books - Mills in Michigan, Indiana, Ohio, and Illinois make newspaper, insulation, and mulch. It’s not only the best way to get rid of your yard waste, but it’s also the easiest. Composting is nature’s way of turning your yard "waste” into a valuable soil conditioner. Saves you money by reducing the need for expensive bags and commercial soil additives. Helps your garden and lawn by improving the fertility and the health of your soil. Saves water by helping the soil hold moisture and reducing water runoff. Benefits the environment by recycling valuable organic resources and extending the lives of our landfills. Composting is a lot easier than you may think. Organic material breaks down around us in nature all the time. Composting is just a way to speed up the process! Most compost bin designs are so simple that they can be built in a few hours. Once you gather your yard waste and form it into a pile, the only time you’ll spend is for occasional maintenance. Then sit back and let nature do the rest! Alternate layers of green and brown materials; keep layers 2’ - 4’ deep. Common green materials are grass, food scraps (uncooked fruit and vegetables, coffee grounds, filters, tea bags, and egg shells) garden trimmings. Common brown materials are fall leaves, straw and dry newspapers strips. Chop up larger material for faster decomposition. Whenever you add a food scrap layer, make sure you sprinkle it with soil and then top it off with a brown layer to prevent smells and flies. Mix bin contents often (minimum once every two weeks). Mix older materials with newer materials. Moisture content of bin should be like a wrung out dish rag. Only add water if pile is very dry after mixing. Pile will shrink. Continue to add mix until bin is almost full. Place carpet on surface of pile to retain heat and moisture. Compost is generally ready to use when it looks like humus (after about two or three months). Aging compost another 1 to 2 months is recommended. Pile up bricks, cement blocks, or rocks to form three sides of a square container. Lay the blocks without mortar, leaving space between to let air through. - Mix 3-6 inches of compost into lawn soil before seeding for grass. - Mix 3-6 inches of compost into garden soil before planting. - Mix compost into the soil of exposed sloping areas to help fight erosion. Add compost as a mulch around flowers, shrubs, and trees to discourage weeds, help soil retain moisture, and protect roots from alternate freezing and thawing during winter months.